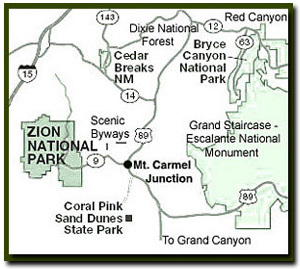 Hiking in Zion National Park's slot canyons , such as the Zion Narrows and The Subway, takes special gear. Check out Bo's Canyoneering Gear equipment list. The ideal shoe for canyoneering and hiking on the sandstone in Zion National Park. When off-trail hiking, the right kind of shoe is important to keep you comfortable and safe as you hike, boulder or canyoneer. La Sportiva makes an ideal shoe that holds up strong to all three challenges. The La Sportiva Exum Ridge is a radical hybrid with suction dot rubber lugs for friction, sticky "frixon" climbing rubber outsole to grip, its super lightweight and dries fast. "The Exum Ridge is the One. If you had only one pair of shoes, this would be it... for running, scrambling, hiking, canyoneering, this is the ticket." Look for a lighter boot or trail shoe that offers the support needed for your adventures. Keep in mind when ordering your hiking shoes that your socks will be thicker than you normally would wear and order the appropriate size. Women with very wide feet might want to consider buying the male version of hiking shoes. Again I have to recommend the La Sportiva Exum Ridge as the best overall hiking shoe. Take advantage of the new high-tech hiking and backpacking gear available. Hiking socks should keep feet dry and blister free by wicking sweat away from your feet and reducing friction. Synthetic hiking socks are ideal for this, but wool socks are also popular. Zion Photo: Alex Korkishko heading out on a canyoneering trip. It's important to have a place like the Desert Rat that can help you choose quality gear for your adventures. Avid Hiker, Climber, Canyoneer and Zion National Park search and rescue member, Bo Beck knows the importance of a good backpack. Determining the volume of your pack will save headaches later on. As a general rule when choosing a soft pack or internal frame pack you'll need 1000-2500 Cu.In. for short to long day hikes; 2500-3500 Cu In. will provide space for equipment needs on longer day hikes to overnight camping trips; 3500 Cu. In. and up will probably serve best for overnight to extended duration backpacking trips; Of course, the volume of the pack you choose will be contingent on the amount of gear you will need to carry (i.e. winter clothing, climbing equipment, shelter, etc.) but as a general rule the gear you choose to take should fit inside the pack and not lashed to the outside of the pack. Internal Frame and Soft frame packs carry much better when balanced well. Heavier objects loaded closer to your torso and in a higher location in the back bag. If heavy objects are lashed on to the back of the pack, the pack tends to pull you backwards and off balance, as opposed to the heavier objects being carried closer to the shoulder tops, and more aligned with your natural center of gravity. Look for many of the same qualities in a day pack that you would for a backpack and avoid the multitude of poor quality day pack's. For some the ease of putting a tent together and taking it apart is important and weight and space is a major concern of any backpacker. Keep this in mind when looking for a tent. A tent might seem light in the store, but those pounds add up when backpacking. Keep in mind the seasons you will be using your tent and make sure it has adequate ventilation and waterproofing. A double top will help with condensation. A good sleeping bag is your key to a restful nights sleep along the trail. Make sure the sleeping bag you choose will keep you warm enough for the temperatures you plan to backpack in. Weight again is an important concern and the warmer the sleeping bag, generally the heavier the bag will be. If you will be sleeping in cold temperatures make sure your sleeping bag has a hood and a good draft collar. A mummy bag is a good choice in cold weather, but can be too confining in warm weather. If there is a chance of getting wet (i.e. canyoneering) or camping out in a very damp environment, a bag filled with a synthetic vs down, may be a benefit; as even when totally saturated, a synthetic fill bag still retains some of its insulative properties, unlike down, when wet will matt and loose most, if not all insulative capacity. Disadvantage with synthetic is that typically it will be bulkier and heavier for the same temp rating. A good sleeping pad does more than serve as a soft cushion for sleeping, it also helps keep you warm. As with all backpacking equipment consider size and weight, but warmth and comfort are essential. During your Hiking, Backpacking or Camping outing, water may be scarce, therefore requiring you to carry enough water for the entire outing. If you know that there will be a reliable source of water during your trek or at your destination, then it is normally accepted that the water source should be treated to remove or kill any harmful bacteria, protozoa, cysts or virus that may be present. Water can be treated in a number of ways; Purification is normally done chemically or with heat, and filtration is normally done using pumps with a filter medium of glass fibre, activated carbon or ceramic or a combination of these. Potable Aqua is one of the most common chemicals used to purify water (Hyperiodide tablets) and can be purchased at most camping stores. Iodine crystals are commonly used too, but create a fairly strong "iodine" flavor that can be neutralized somewhat by adding ascorbic acid (vitamin c) into the treated water. Boiling is still the best method to kill any and all harmful microorganisms, including viruses, and water that has been boiled for 2 minutes at a rolling boil, is safe to drink. Filters are very common now and work well and are easy to use for drinkable water immediately after pumping, however a filter will not remove viral contaminant (.005 Microns) so if virus is suspected then purification should be administered.